Gallops, tonight’s first and only support, have barely made it through a quick sound check when I become genuinely concerned that the band’s drummer is about to kick off with the guy in charge of the Deaf Institute’s sound system. Apparently something wasn’t loud enough, and he really wasn’t happy about it. But then, the temperamental ones are usually the most talented musicians, and Gallops and their angry drummer, who performs like a man possessed, are absolutely no exception. The North Wales instrumental four-piece create a splendid racket, complete with ear-splittingly powerful drums (I quickly understand why it was necessary that they be loud) and Battles-esque, experimental noise made up of dual guitars and keyboards. Both guitarists are incredibly skilful, and compared with some random but thoroughly enjoyable tempo changes and amazing synths, Gallops manage to produce a few sprawling epics during their short set. The main attraction, Brighton’s Esben and the Witch, are preceded on stage tonight by some ace props, including a couple of old-timey streetlamps and a skull thrown in for good measure. And, thanks to heavy use of a smoke machine, by the time the band make an appearance, they are mere silhouettes amidst a creepy, gothic background - which is undeniably fitting given the type of music that Esben and the Witch pride themselves on playing. Admittedly, the band is something of an acquired taste. If you’re after a bit of a dance, something lively and up-tempo, then don’t be going to an Esben and the Witch gig. If, however, you’re into an amazing performance from an enigmatic trio of musicians playing a unique combination of drone, post-rock, post-punk and shoegaze with a bit of electronica thrown in, well, you’re in for a treat. Esben’s lead vocalist/percussionist/bassist Rachel Davies is a musical force to be reckoned with; her ethereal voice is hauntingly beautiful, and has already earned her comparison with the likes of Portishead’s Beth Gibbons (one which is not entirely unfounded). Guitarists and blokes-in-charge-of-samples-and-the-like Daniel Copeman and Thomas Fisher add some distorted riffs and beats which sit remarkably well on top of Davies’ tribal, simplistic percussion. At one point during their set, all three band members crowd round the solitary drum and cymbal to produce an incredible solo – no mean feat using just the one drum. In fact, throughout the performance Esben and the Witch beat the living daylights out of said drum as if they’ve got some serious unfinished business with it, all to good effect. Due to more or less complete lack of conversation with the audience tonight, it is difficult to distinguish any names of the songs played, however I do recognise an effortless version of single ‘Marching Song’, an eerie rendition of ‘Warpath’ from their forthcoming album, and an excellent song I believe (and I may believe wrongly) to be entitled ‘Done Because We Are Too Menny’. Esben and the Witch make for an unsettling live experience; a combination of primitive drum beats, otherworldly vocals and spacey guitar and keyboard sounds certainly leaves a lasting impression on the hugely appreciative Manchester audience. The guy sat next to me seemed to really enjoy their set, so much so that he spent most of it waving his arms around, throwing back his head as if he was in some kind of massive rave only he knew about. 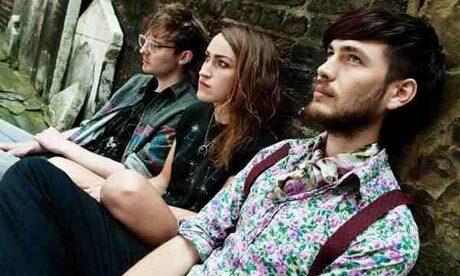 Apparently that’s the effect these three talented individuals have on a room full of gothic-tinged indie folk. The band’s eagerly-awaited debut LP ‘Violet Cries’ is due for release on January 31st of next year, according to the band’s own website. We get a taste of the forthcoming album tonight, and it promises to be something very unique, and certainly worth the wait.